Converted daily to RTW operation. Saturday & Sunday withdrawn between Tottenham and Lower Edmonton. Routemasters transferred to Poplar for start of Trolleybus Conversion scheme. Sunday evening Route introduced between Victoria and Liverpool Street. Sunday evenings withdrawn between Victoria and Liverpool Street. Front entrance Routemaster operation commenced. Withdrawn between Waterloo and Victoria except Mon-Fri peaks. Withdrawn between Waterloo and Victoria except for Mon-Fri peaks to Westminster. 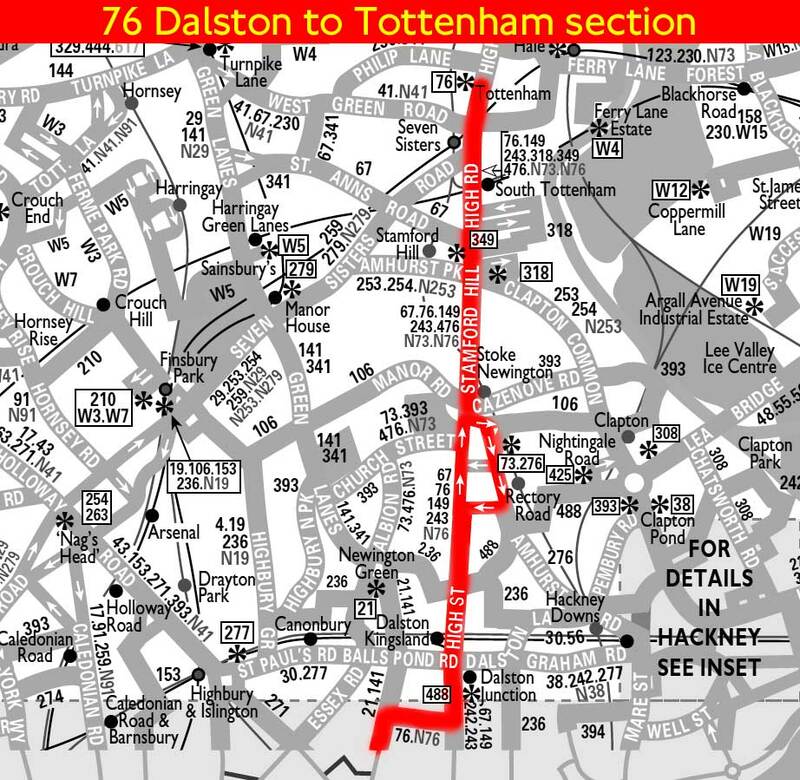 MON-FRI Withdrawn between Tottenham and Edmonton except for Brimsdown journeys. Rerouted via St Pauls and Ludgate Circus instead of Queen Victoria Street. Re-routed between Westminster and Victoria via Millbank and Horseferry Road. Converted to One Person Operation daily. Re-routed between Waterloo and Victoria via Lambeth Bridge and Lambeth Palace Road instead of Westminster Bridge and Millbank. Withdrawn between Waterloo and Victoria outside Mon-Fri peaks and withdrawn Sunday altogether. Northbound journeys from Waterloo stand in Cornwall Road rerouted via Bayliss Road in order to serve County Hall and York Road. Withdrawn between County Hall and Victoria. Re-routed between Waterloo and Mansion House via Aldwych and Ludgate Circus. Withdrawn between Tottenham and Northumberland Park - withdrawn section covered by new 476.